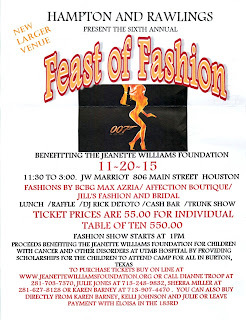 On November 20th from 11:30 a.m. to 3:00 p.m., the 6th Annual Feast of Fashion will be held at the JW Marriott Hotel at 806 Main Street, Houston, TX 77002. This annual event, organized by Julie Jones, raises money for the Jeanette Williams Foundation which raises money to send children with cancer and other serious illnesses to camp. It is a great cause and involves a tremendous effort by a lot of people -- especially Julie. 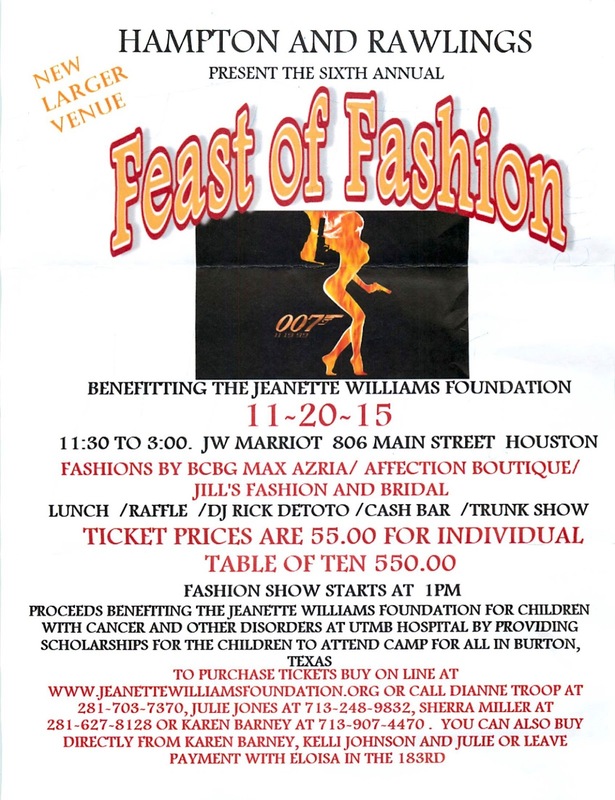 Tickets are $55.00 each (or $550.00 for a table for ten) and can be purchased online at www.jeanettewilliamsfoundation.org. In a somewhat unanticipated move, former Court of Criminal Appeals Judge Morris Overstreet has announced his candidacy for Harris County District Attorney on the Democratic ticket. He will be running against defense attorney Kim Ogg in the primary. I only know Judge Overstreet in passing, but he's always been very nice to me. To be honest, I was unaware of all of his credentials. I didn't realize he was a former-prosecutor and I certainly didn't know he was formerly on the Court of Criminal Appeals. He has an extremely impressive resume and a very interesting background. I was anticipating the primary season to be kind of quiet in 2016. Looks like I was wrong. Kim Ogg should be very concerned. Has Batson gone as far as it can go? I've written a post over at Fault Lines on the Timothy Tyrone Foster case that the Supreme Court case heard yesterday. If you haven't been following it, prosecutors on a 1986 case were pretty blatant in writing down and singling out the African-American members of a jury panel and then striking them with peremptory challenges. Although the case is egregious, what more can the Supreme Court do to enforce Batson? I wrote more about it here. I hope you will check it out.